Top Picks: Our 10 Favorite Dog-Friendly Hotels in the U.S.! Americans sure love their dogs: there are about 78 million of 'em. And we love to spoil them, spending over $60 billion dollars every year. So it's hardly surprising that we want to bring them along on a vacation or road trip. It used to be, pet parents had to sneak Fido into the room, but these days, more hotels are openly welcoming dogs. 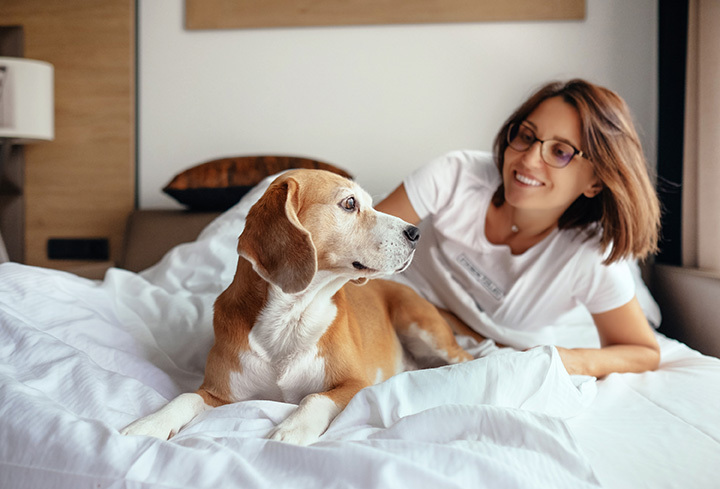 The meaning of "pet friendly" varies: some hotels merely allow them in the room, while others take the experience to a level that will have a dog wriggling with delight. Check out ten tail-wagging hotels across the country. Your pooch gets doggie treats upon check-in - and can indulge again during tea time in the lobby. If you really want to spoil him, sign up for the in-room "Rover Reiki Massage." This luxury resort is considered the most dog-friendly hotel in New England. They offer dog massage, nighttime turn-down service on the doggy bed, gourmet food and dog biscuits that are made in-house. Rover can settle in on a plush dog bed after munching on the hotel's homemade dog treats. They offer dog-sitting and -walking services during your stay, and donate a portion of your pet's bill to local animal charities. While visiting the Big Apple, Fido gets Big City treatment. He's given a bone-shaped pillow to chill on, homemade dog treats and more. On a rainy day, the hotel loans cute Burberry raincoats to keep pooches dry on their walk. Your pup will be welcomed with a special ID tag and "welcome" letter. Along with a plush dog bed, the hotel also provides a list of nearby vets, groomers and more. Upon arrival, doggy guests are given a special golden collar tag (which they can keep). They can also enjoy delicious in-room dining, and even book a "play date" with a pet butler. It features a gourmet pet menu, special bowls and beds, and pet-sitting services. But the kicker? The hotel provides a Puppy Jet Lag Kit to help them adjust to the altitude. This historic hotel gives dogs a five-star experience with their own gourmet menu. You can up the game further with their "Pampered Pooch" package, which includes a silver dog tag. Dogs are treated like celebrities, with a menu that includes Grilled Filet of Beef and caviar. Pet spa services are offered, like massages and facials (yes, dog facials).